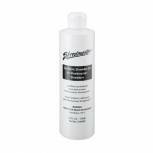 Fellowes Shredder Oil 355ml 35250 Pack of 1 Lubricates shredder blades. Improves functionality of your machine. Increase life of shredder. Decrease replacement costs. Specifically designed for Fellowes shredders. Keeps cutting blades clean and free from paper dust. 355ml per bottle. 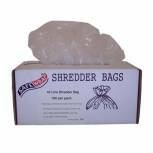 Safewrap Shredder Bag 150 Litre (Pack of 50) RY0472 Pack of 1 Shredder bags to fit most models. Durable polythene construction. Supplied in a box for easy storage. Capacity: 150 litres. Colour: Clear. Pack of 50 bags. 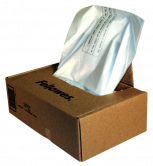 Fellowes Clear Shredder Bags C-385/C-485 (Pack of 50) 36055 Pack of 1 Designed for Fellowes shredders. Easy-access dispenser. Can be used in any shredder with a capacity of up to 165 litres. Quick and simple to change. Pack of 50 sacks. Colour: Clear. 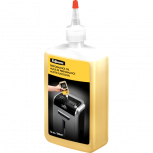 Q-Connect Shredder Oil Aerosol 150ml KF14455 Pack of 1 Q-Connect shredder oil for use with all Q-Connect shredders. 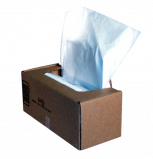 Prolongs the life of your shredder if used regularly, reduces service costs and reduces shredder noise. 150ml aerosol. Safewrap Shredder Bag 200 Litre (Pack of 50) RY0473 Pack of 1 Shredder bags to fit most models. Durable polythene construction. Supplied in a box for easy storage. Capacity: 200 litres. Colour: Clear. Pack of 50 bags. 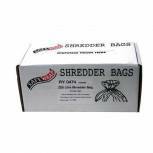 Safewrap Shredder Bag 250 Litre (Pack of 50) RY0474 Pack of 1 Shredder bags to fit most models. Durable polythene construction. Supplied in a box for easy storage. Capacity: 250 litres. Colour: Clear. Pack of 50 bags. 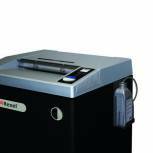 Rexel Shredder Oil Auto Oiling. For use With Auto oiling systems only. 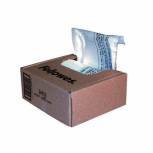 4400050 Pack of 1 Rexel Shredder Oil. For use with shredders with auto oiling systems only - RM31602, RM31605, RM31599, RM31615. Simply install the bottle and replace when empty. Rexel Shredder Lubricant 473ml 1760049 Pack of 1 Rexel Shredder Lubricant 473ml. Simply squirt onto a sheet of paper and feed that into the shredder. (Do not apply directly to cutting head). Recommended for Rexel Large Office, Mercury Departmental & Wide Entry shredder models. Not for Auto+ models. 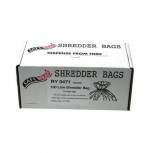 Safewrap Shredder Bag 40 Litre (Pack of 100) RY0470 Pack of 1 Shredder bags to fit most models. Durable polythene construction. Supplied in a box for easy storage. Capacity: 40 litres. Colour: Clear. Pack of 100 bags. 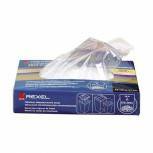 Safewrap Shredder Bag 100 Litre (Pack of 50) RY0471 Pack of 1 Shredder bags to fit most models. Durable polythene construction. Supplied in a box for easy storage. Capacity: 100 litres. Colour: Clear. Pack of 50 bags. 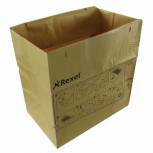 Rexel Brown Recyclable Paper Shredder Bags (Pack of 50) 2102248 Pack of 1 Rexel Large Recycling Shredder Waste Sacks manufactured from material which can be recycled along with the contents. The waste sacks self seal to make waste disposal clean and efficient. Dimensions - L30 x H510 x W490mm. Rexel Non Auto oiling Oil Sheets (Pack of 12) 2101948 Pack of 1 Shredder Oil Sheets prolong the life of your shredder. They distribute the right amount of oil every time and are safe for use with all shredders. The easiest way to oil your shredder. 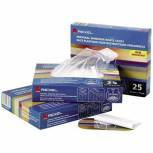 Rexel Non Auto oiling Oil Sheets 2101949 (Pack of 20) Pack of 1 Shredder Oil Sheets prolong the life of your shredder. They distribute the right amount of oil every time and are safe for use with all shredders. The easiest way to oil your shredder. 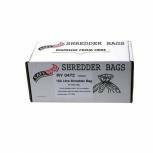 Rexel Plastic AS1000 Shredder Waste Sacks (Pack of 100) 40070 Pack of 1 Rexel Shredder Waste Sack Pk 100 AS1000 40070 RDS2250 Shreds up to 22 sheets into 5. 8mm strips. Auto shut off after 2 minutes of non use. Shreds staples, paper clips, credit cards and CDs. 115 litre waste bin. Security level P-2. 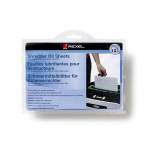 Rexel Plastic AS3000 Shredder Waste Sacks (Pack of 100) 40095 Pack of 1 Rexel Shredder Waste Sacks 175L. Plastic waste sacks for convenient collection and handling of shredded material. 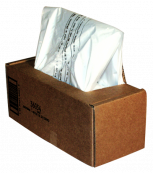 Useful for storage if shredded material is to be recycled or re-used as protective packaging. AS3000 (40095). 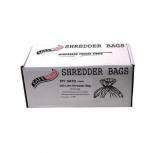 Fellowes Power shred Shredder Waste Bags (Pack of 50) 36056 Pack of 1 Designed for Fellowes shredders. Easy-access dispenser. For use with Fellowes Powershred machines. Can be used in any shredder with a capacity of up to 94 litres. Quick and simple to change. Pack of 50 sacks.